I started my notes for May last year by mentioning that, at the time of writing, there was still snow on the roof of our conservatory. . . it’s a bit different this year! One thing is the same, though, and that is that the planet Jupiter is visible in the night sky. It will be in the southwest and probably the first “star” you can see as the Sun sets a little after eight thirty. Look out for it especially on the 4th when a crescent Moon is close by. As the sky darkens after nine o‘clock, Jupiter, the Moon and the bright star Procyon can be seen forming a line in the western sky. They are all sitting within that veritable murmuration of stars in the sky – the Milky Way – but looking towards the quieter part of the sky in the south, we now have another major planet. This is Mars and the easiest way to be sure that it is, is to look straight upwards over the top of your head! Here you will find the asterism that everyone knows: the Plough or Big Dipper. 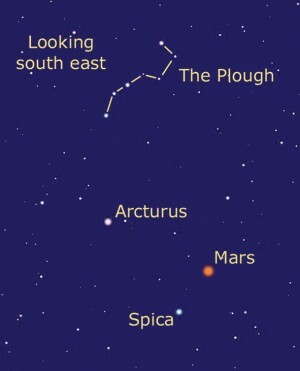 If you follow the curve of its handle, it points towards quite an orange star, Arcturus (which could be confused with Mars) but if you carry on curving downwards, you would normally land upon the bright star Spica. This month, though, the Red Planet will catch your eye first, being very bright and very orange because its orbit is bringing it closer to us this year. The Roman god of war (to the Greeks he’s Ares), Mars was much worshipped by the armies that built the Roman Empire. It is red for exactly the same reason that your blood is; the presence of high levels of oxides of iron or rust! Roaming around on its surface right now is the largest lander ever sent to another planet. This is Curiosity, weighing more than a car and with a larger footprint than your average family saloon. It is much more than just a rover; it is a travelling laboratory, able to carry out various investigations and experiments. It even has a reversing camera! On the 11th a very bright, near-full Moon comes to play with Mars and Spica just as it did with Jupiter a few days before. The Moon is a handy guide to another planet on the 30th of the month, when its thin crescent will be just below Mercury in the evening twilight – although you can start looking out for this tiny planet from about the 15th. If you stayed awake whilst reading last month’s notes, you may remember that I mentioned the launch of the Orbital 2 Commercial Resupply Services craft on the 1st. Well, it is now scheduled for the 6th but you will need to consult http://www.heavens-above.com to be sure. More certain is the launch of Soyuz 39 on the 28th, carrying a new crew to the space station. Heavens above, it is busy up there in space!